Upon return from a long needed vacation, I was stunned to see how our pepper plants had gotten so overloaded with big ripe fruits that I knew that I needed to come up with an idea to deal with them. I have chopped and frozen them in the past. I wanted to try something…else? I often run my “sun” dried tomatoes through the food processor to use them as what I call “tom jam”. So I decided to roast the peppers with some garlic and see if I could come up with a (sort of) relish to keep in the frig for the coming cold season. The idea is not a new one. But I decided to do it a little differently (can’t help myself). I topped and seeded the peppers first (its easier when they’re raw.) I also just put them in a grill basket and used the grill with the garlic in a bowl. After they roasted, I only removed the burnt spots then did a very rough chop. I also gave them a quick dunk in some white vinegar. I peeled the garlic and tossed it and the peppers in my food processor. Some ground cumin, coriander, salt and pepper went in. I added some coriander chutney but fresh cilantro would be just as good (if not better). Process with a bit more vinegar and olive oil. You want it to have a bit of vinegar flavor (helps keep down bacterial growth). Season to your liking. 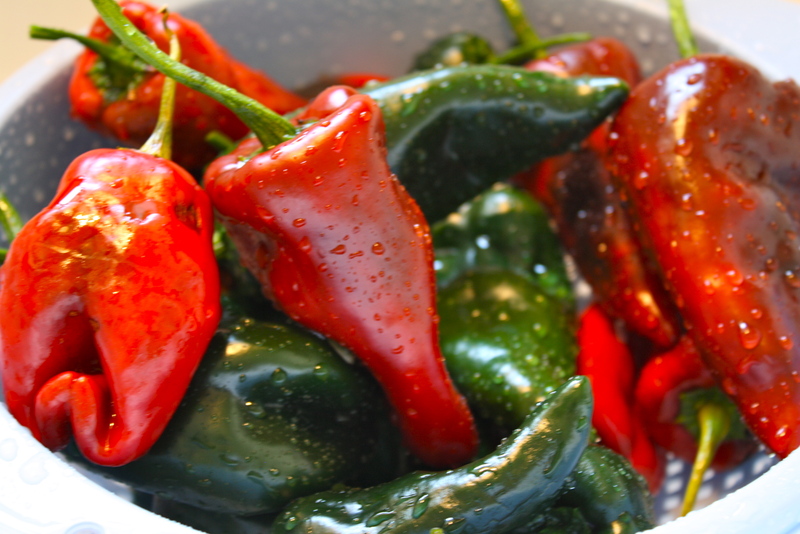 I plan to add it to any dish where I want that poblano flavor to be. After taking some from the jar (with a clean spoon please), just cover the remaining with a layer of olive oil. It should keep for quite a spell. This “relish” is not to store at room temp and must be refrigerated. I used a couple of tablespoons of it with 4 oz of light cream cheese and a bit of feta. Made a great dip for friends coming for dinner. 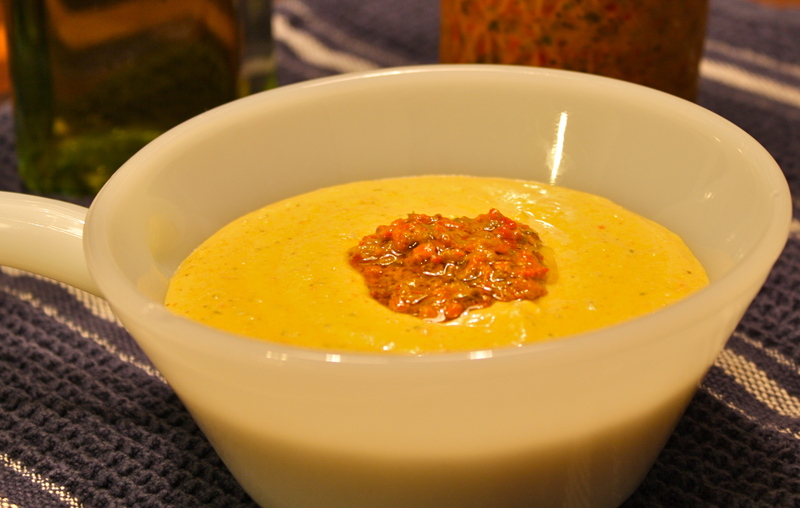 I have also used it as a mix in for my hummus…..very tasty. Keep in mind-all amounts are a very general approximations.. 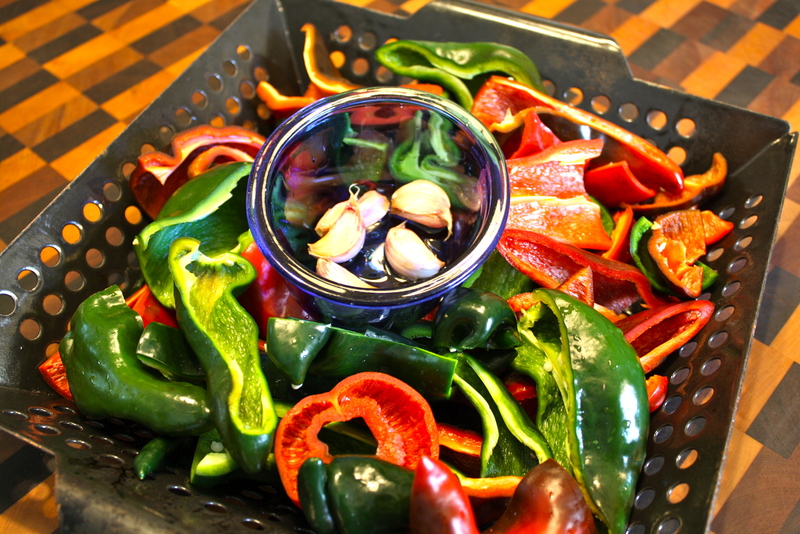 Put prepared peppers in a grill basket. Place garlic in a small ovenproof bowl. Drizzle with olive oil. Set in center of grill basket. Roast (I used my gas grill) at 400 F for 20-25 minutes or until peppers are soft and show some blackening. Remove from heat and allow to cool. 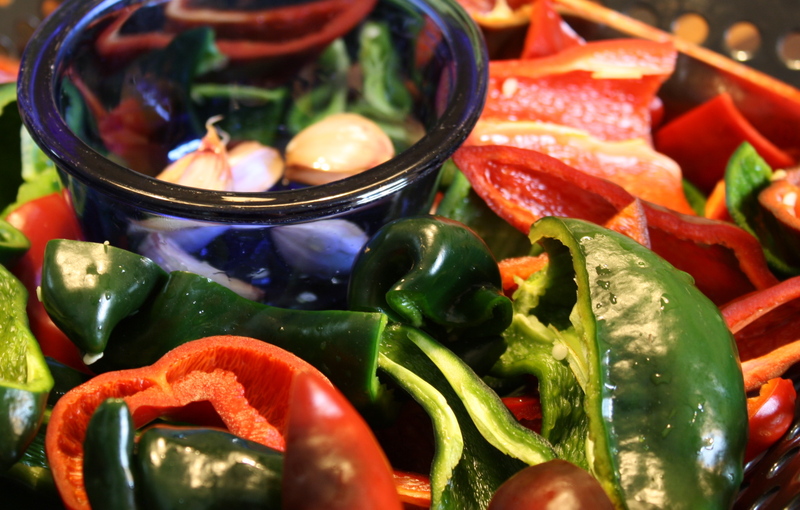 Peel garlic and roughly chop the peppers. Dip both briefly in white vinegar then place in food processor. Add spices and cilantro. Add at least a couple of tablespoons of vinegar then process on low. Stream olive oil through top opening until relish comes together. Open and check seasonings. Adjust to suit your taste. Be sure it has at least a slight vinegar taste to aid in preservation. Process to desired texture. Spoon into sterilized jars making sure to avoid air pockets. Cover with a thin layer of olive oil. Seal and keep refrigerated. Properly prepared and handled, this should keep for several months. Enjoy!